Image caption The new Spyker model was originally meant to roll off the Coventry production line in April. Car production could be returning to Browns Lane in Coventry, the former home of a Jaguar plant. Automotive firm CPP Global Holdings Ltd, manufacturers of off-road car Bowler, has signed a land purchase agreement. The firm currently operates from five sites in Coventry, employs 250 staff, and plans to bring its operations to the site. Browns Lane was home to Jaguar car production until it moved in 2005. Production was moved to Castle Bromwich in the West Midlands, although its engineering site is still based in Whitley. 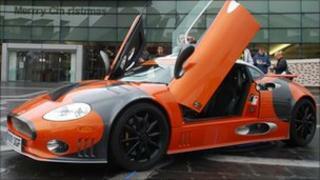 CPP signed a memorandum of understanding to buy luxury car producers Spyker in February. This has lapsed but the firm is confident a deal will be completed. The company is purchasing 23 acres of the Browns Lane site from Advantage West Midlands with planning applications to be submitted before the end of 2011. It is hoped redevelopment will start in 2012. Company founder Brendan O'Toole said the news was a decisive moment in his company's strategy to cement Coventry's reputation as a "world-class centre of automotive excellence". His business partner, Vladimir Antonov, said the move demonstrated the firm's commitment to remaining in the heart of Coventry. "It will help CPP to create hundreds of new jobs, establish advanced new facilities and is a major investment into the economy of the city and the surrounding region," he said. Coventry was once home to car production on a large scale. It was home to electric vehicle makers Modec until February when the firm went into administration. London Taxis International, which makes the traditional black cab, still has its headquarters and a car assembly plant in Coventry.